Interstate Relocation services | Save 50% Using You Pack Remoavls ""
If you’re reading this thinking about the dreaded process of interstate moving, you can take a big sigh of relief. You Pack Removals is here to help. Affordability and efficiency are just two of the main aspects of our service that we pride ourselves on. As Australia’s number 1 moving company with a self pack option, we have created a system that will streamline your relocation, making your move stress-free and organised no matter where you are headed. Why choose You Pack Removals? There is a feeling of incompleteness and stress associated with moving house with boxes lying around and taking up space. With You Pack Removals however, you are given your own container ahead of moving day, so you can fill it at your own pace and break the process down into smaller steps. The DIY Container is placed in an unobtrusive location, collected for you once packed, delivered to your new address and picked up when you’re finished. No stress. No fuss. In addition to provide options for cheapest way to move interstate , You Pack Removals™ also offer transport solutions for cars, boats, machinery and general freight. I feel overwhelmed with the packing process. Where do I start? Are you wondering what you can do to prepare? We break down the moving process into a four-week system beginning with the creation of checklists and labels, through to insurance quotes and phone connection transfers, finishing with the packing of your moving container. You can access these tips via our website by clicking here. You Pack Removals is more than the name suggest. 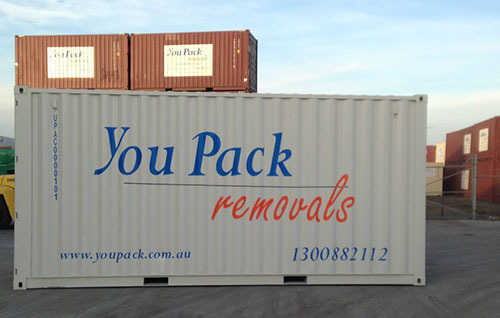 On top of offering interstate removals, we also provide storage options for your container, on your own property or at a one of You Pack Removals™ locations – which can be found Australia wide. Find peace of mind with You Pack Removals. Contact our friendly team of experts for further information or visit us online.